There are many toxic plants that can be found in your yard and around your house. Many factors can affect how much of the toxin is ingested, including: part of the plant, condition of the plant, stage of growth the plant is in, time of year, species of plant, age/size/species/condition of the animal ingesting the plant, and amount of plant ingested. These are just some of the most common and deadly plants we see affecting our patients. Often found in Fall, mushrooms have over 100 toxic species, but the most toxic are the pretty red ones, known as Agaric mushrooms and Amanita mushrooms. Toxic ingestion symptoms include: diarrhea, vomiting, and a faster heart beat. If an animal eats these, it should be considered an emergency and your veterinarian should be contacted immediately to induce vomiting. Permanent liver and kidney damage can occur. 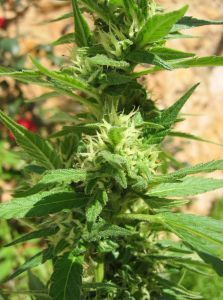 Symptoms of Cannabis/Marijuana ingestion can be: lethargy, droopy eyes, disorientation, acute incontinence, seizures, and hyper-excitement. Recovery after treatment is usually within 24 hours; however the more potent the strain, the more potent the symptoms. 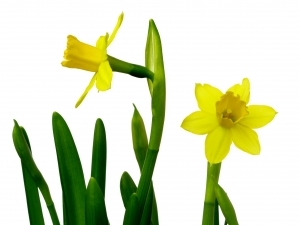 Daffodils, seen commonly in flower beds, have toxic bulbs if eaten, and can cause gastrointestinal upset. 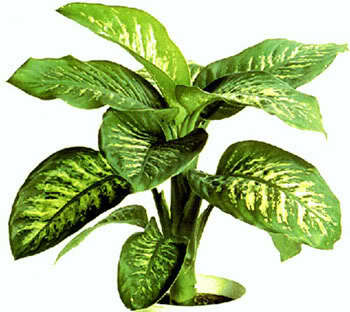 Dieffenbachia/Dumb Cane is a common household plant. They can cause a severe oral irritation, causing salivation and swelling of the tongue. Pets that consume this plant often need pain medication and steroids to help them through their recovery. Philodendron/Elephant Ears, also a common household plant, exhibit the same symptoms. 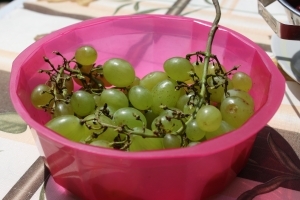 Grapes/Raisins are one of the few toxins that are not dose specific. They have an unknown nephrotoxin that can cause anorexia, depression, vomiting, diarrhea, and acute renal failure. Symptoms can last several days and often need hospitalization with induced vomiting and IV fluid therapy for a full recovery. 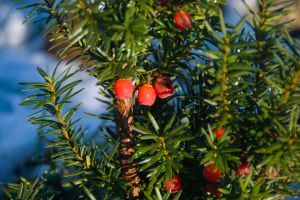 Japenese Yew is a beautiful shrub found in many yards. It is extremely toxic dry or fresh. If ingested, this is considered an emergency and veterinary medical attention should be sought immediately. This is a cardiac depressant, so many pets will go into cardiac arrest after ingesting it. If the pet is able to be stabilized, then medications to induce vomiting and then coat and soothe the stomach are usually given, as well as hospitalization with IV fluids. 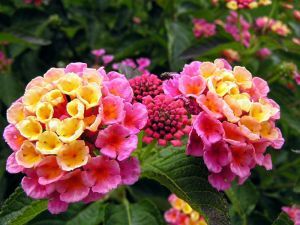 Lantana is a flowering bush that is common in yards. It comes in many colors; however the purple is less toxic than the red or yellow. If consumed, it causes gastrointestinal upset for about 3-4 days, usually manifesting symptoms of bloody diarrhea. Veterinary care usually includes medication to soothe the gut and antibiotics. 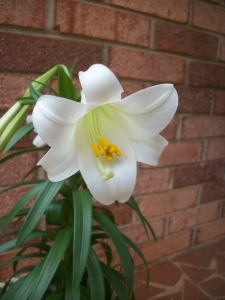 A familiar scene around the house at Easter is the Lily. It is a nephrotoxin and especially toxic to cats, especially the flowers and leaves. A cat only needs to ingest 1-2 leaves for toxicity to occur. Early signs of ingestion include salivation. Late signs include renal failure. Hospitalization with your veterinarian is recommended for induced vomiting and IV fluids if immediately after consumption. If caught late, then long-term renal management is sometimes an option. 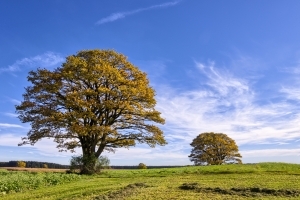 Oak Trees, including the leaves and acorns, are toxic and habit forming. The pet will need to eat 40% of their diet to exhibit symptoms usually. Symptoms usually present with constipation and then progress into diarrhea, and hemorrhagic gastroenteritis. Renal disease can also occur. Maintaining hydration is very important, so supportive veterinary care is encouraged. 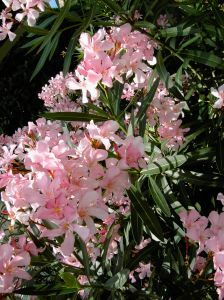 Oleander is a beautiful flowering bush that is not only toxic to humans, but also toxic to pets, especially dogs. Dogs only need to ingest 1-3 leaves for toxicity to occur. It is cardiotoxic, but can also cause gastrointestinal signs including vomiting and diarrhea. If the pet is able to be stabilized, then medications to induce vomiting and then coat and soothe the stomach are usually given, as well as hospitalization with IV fluids. One of the most common toxins we see at TLC is Sago Palm (Cycas species) toxicity. 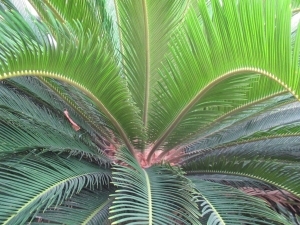 It is a smaller palm plant that sits lower to the ground and is often used in landscaping. All parts of the plant are toxic. Although, the leaves and seeds are the worst. Symptoms usually present within 12 hours of ingestion. It is a hepatotoxin. Vomiting and diarrhea are often present. Other signs include: neurological degeneration, weakness, and progressive rear limb paralysis. Immediate veterinary care is recommended for induced vomiting and IV fluid; long term care is expected. If you believe your pet has been exposed to a toxic plant, please contact your veterinarian. The earlier we can act, the greater the chances of a full recovery.